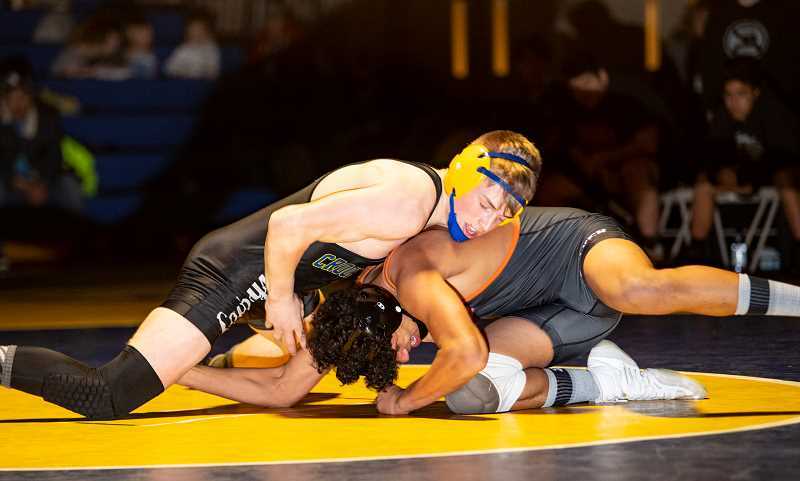 Crook County dominated this year's Cowdog Classic, crushing Culver 46-12 in the annual dual between two of the top wrestling teams in their respective classifications. Wrestling on senior night and coming off of a second-place finish at the Oregon Wrestling Classic, the Cowboys looked like they had something to prove during the match. "It's always good to compete, and it's a good little rivalry that Culver and us have," said Crook County head coach Jake Gonzalez following the win. "Culver is game to wrestle us, and anytime you can compete, it's good." Although he was disappointed in the outcome, Culver head coach J.D. Alley agreed that the rivalry is good for both teams. "It's good for both of us, I think," he said. "They probably wrestled eight duals last weekend just like us and short of one or two of them, this was probably some of the better wrestling that they got the whole weekend." The dual started at 152 pounds, and Crook County jumped out to an immediate lead with Ben Sather taking a 4-2 decision over Hunter Augustynovich to give the host Cowboys a 3-0 team lead. A 6-0 Gavin McLean victory over Isaiah Toomey at 160 pounds gave the Cowboys a 6-0 lead. Then came one of the most competitive matches of the evening as Crook County's Garrett Bond held on to edge Joseph Russo 9-8 in their 170-pound match. The win pushed the score to 9-0, and the Cowboys were rolling. It didn't take Kyle Knudtson long to assert his dominance as Crook County's 182 pounder made quick work of his match with Isaac Anores, earning a first-round fall to put Crook County ahead 15-0. Then in one of the most competitive matches of the evening, Culver's Cylus Hoke survived to take a 4-3 decision over Jaxson Rhoden at 195 pounds. Rhoden is ranked No. 1 in the state at the Class 5A level at 182 pounds, while Hoke is the No. 1 ranked Class 2A 195 pounder. Hoke scored four points early, then survived the rest of the match as Rhoden physically worked him over for the final five minutes of the match. Rhoden appeared to hurt his shoulder early in the match but continued wrestling and physically dominated the remainder of the match. "There was an interesting exchange early," Alley said. "Cylus can usually get away from people, but he couldn't get away from Jaxson. Jaxson worked him over pretty good. I would like to have seen what that would have been like if we had needed to get away. And a credit to Jaxson on senior night. He was going to fire all the bullets in the gun, wasn't he?" "It was a good match," Gonzalez agreed. "You can't give up points to a tough kid. Jaxson gave up two back points to start the match. He will be alright though. He's a tough kid." Crook County got more bad news on the injury front in the next match. Crook County's Hayden Hilderbrand and Culver's Eduardo Penaloza were locked in a tight dual when Hilderbrand injured his leg late in the second round. Penaloza was leading 9-7 at the time and Hilderbrand appeared to earn an escape, then collapsed on the mat in pain from a lower leg injury, giving Penaloza the victory by injury default. Hilderbrand was in the varsity lineup because normal 220 pounder Mario Hanson was already out for the season from a broken leg he suffered in early January. The injury leaves the Cowboys with a hole in their lineup and makes Hilderbrand part of a growing list of injured Cowboys. The Penaloza win put Culver back in the match, trailing just 15-9. However, from that point on, it was all Cowboys. First, Caleb Parrott made quick work of Martin Negrete, pinning the Culver heavyweight just 33 seconds into their match. Then, Crook County's Tucker Bonner picked up a 9-5 decision over Culver's Brody Piercy at 106 pounds. Tannon Joyner followed that up with a first-round pin of Jordan Piercy at 113 pounds as the Cowboys pushed their lead to 30-9. Wrestling in the first varsity match of his career, freshman Wyatt Wood then picked up a 9-6 decision over Noel Navarro at 120 pounds. Wood opened a lead in the first round, then survived a late rally by Navarro to pick up the victory. "It felt pretty good," Wood said. "I just went out there and did my best. When they said my name, I felt very honored to wrestle varsity. I tried to control the match, but I got a little tired at the end." Gonzalez was also pleased with Wood's performance. "He hasn't been in the lineup, and he beats a tough kid from Culver, so that's good," he said. Then came the most anticipated match of the evening as two No. 1 ranked wrestlers squared off against each other at 126 pounds. Lorenzo Vasquez of Culver is the Class 2A defending champion at 120 pounds, while Crook County's Hunter Mode won a Class 4A state title last year at 106 pounds. Lorenzo bested Mode 10-0 at last year's Cowdog, but Mode avenged the loss Tuesday night with a dominant 8-0 win. Mode nearly pinned Vasquez in the first round but ran out of time as the clock expired to end the round. Mode then went on to dominate the remainder of the match, although he was unable to put Vasquez on his back again. "It honestly boosts my confidence a lot," Mode said. "It shows that the work I put in over the past year improving my skills paid off. So that's nice." "Hunter cranked on him," Alley said. "He kind of got embarrassed last year. I think they were afraid that we would bump Lorenzo up to 132 pounds because we had two wrestlers not make weight. Hunter wanted that match bad enough that he had to come and talk to me, and we probably owed him that." The major decision increased the Cowboy lead to 37-9 and guaranteed the Cowboys a victory regardless of the outcome of the final three matches of the dual. Next up for the Cowboys was Zach Mauras, who picked up a first-round fall over Culver's Braeden Chapman at 132 pounds. Culver earned their final victory of the night at 138 pounds with Anthony Hood earning a 7-4 decision over Gage Perry. Perry, who missed most of the Oregon Wrestling Classic with a thumb injury, had his hand heavily taped for the match, but showed no other ill effects from the injury. Perry led early in the match, but Hood, who is ranked third in the state, used his experience to pull away from the unranked Perry late in the match. The Cowboys then closed out the night with a Brayden Duke victory over second ranked Lane Downing at 145 pounds. Downing, a junior, was wrestling up a weight class. Duke, a freshman, jumped on top early, then survived a stall call in the third period as Downing tried desperately to turn him to his back, but was unable to do so. "I feel like we competed good," Mode said. "There's definitely some stuff we need to work on and adjust. We are missing a couple of people, but people are stepping up for the people who are out, so that's good." 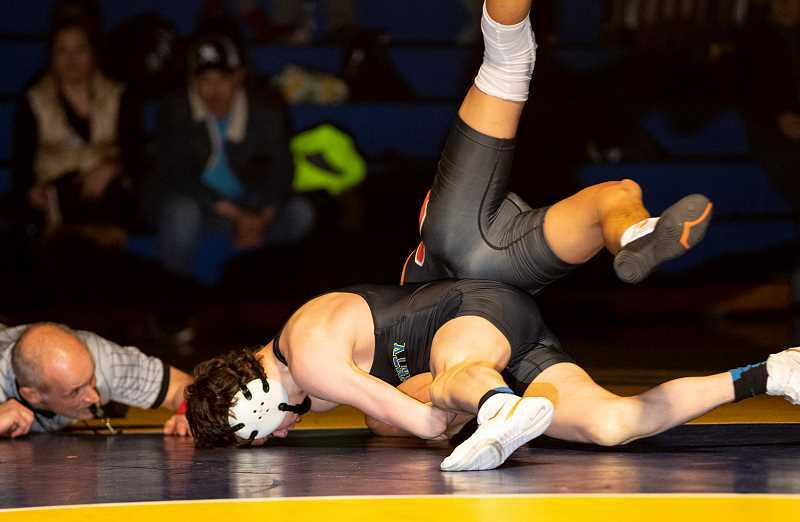 Both Crook County and Culver compete this weekend at the Reser's Tournament of Champions, which is held at Liberty High School in Hillsboro today and Saturday. The Cowboys are the defending tournament champions, while Culver placed 10th a year ago. 106 — Tucker Bonner CC, by decision over Brody Piercy, C, 9-5. 113 —Tannon Joyner, CC, by fall over Jordan Piercy, C, 0:49. 120 — Wyatt Wood, CC, by decision over Noel Navarro, C, 9-6. 126 — Hunter Mode, CC, major decision over Lorenzo Vasquez, C, 8-0. 132 — Zach Mauras, CC, by fall over Braeden Chapman, C, 1:20. 138 — Anthony Hood, C, by decision over Gage Perry, CC, 7-4. 145 — Brayden Duke, CC, by decision over Lane Downing, C, 5-3. 152 — Ben Sather, CC, by decision over Hunter Augustynovich, C, 4-2. 160 — Gavin McLean, CC, by decision over Isaiah Toomey, C, 6-0. 170 — Garrett Bond, CC, by decision over Joseph Russo, C, 9-8. 182 — Kyle Knudtson, CC, by fall over Isaac Anores, C, 1:27. 195 — Cylus Hoke, C, by decision over Jaxson Rhoden, CC, 4-3. 220 — Eduardo Penaloza, C, by injury default over Hayden Hilderbrand, CC. 285 — Caleb Parrott, CC, by fall over Martin Negrete, C, 0:33.